3" interior hardwood turned stair newel posts. 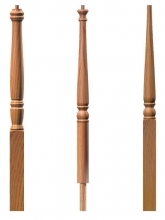 Red oak, poplar, and hard maple newel posts are in stock for quick ship. 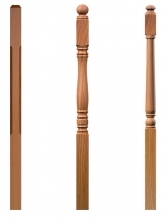 Some wood newel posts are in stock in american cherry. White oak, brazilian cherry (jatoba), soft maple, african mahogany, santos mahogany, lyptus, walnut, hickory, ash, birch, white pine, yellow pine, and antique heart pine, have a 2 week lead time to manufacture. Custom wood turnings are not limited to stair posts. Custom Hardwoods offers hardwood posts made special for kitchen and bath tops.